After a relatively calm night, Gaza rocket fire resumed Sunday morning. Color Red sirens sounded in Sderot and the Shaar Hanegev Regional Council one after the other. Three people suffered mild shrapnel injuries and two people suffered shock. Two cars, including a neighborhood watch cruiser in Sha'ar Hanegev, sustained damage. Meanwhile, a rocket hit a factory in the Sderot area. No injuries were reported but damage was caused to the building. This was the fourth time the factory has been hit by rockets. 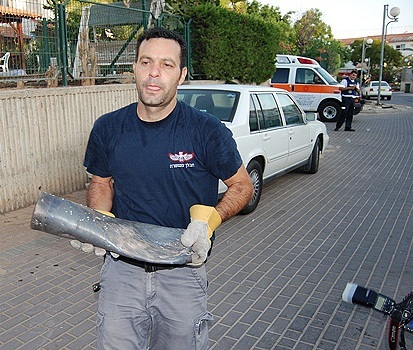 The al-Quds Brigades, the Islamic Jihad's military wing, claimed responsibility for the rocket fire. The vehicle hit left two men in their 50s lightly injured. A third man, in his 40s, suffered shrapnel wounds. In Sderot two people suffered shock. All of the injured were taken to the Soroka and Barzilai medical centers. One of the rockets fired from Gaza landed in a soccer field. The school day in Eshkol, Shaar Hanegev, Sdot Negev and Gan Yavne was canceled over the security situation. On Saturday a total of 31 rockets were fired from Gaza at Israel. Since midnight, some 23 rockets hit southern communities. Earlier on Sunday, two rockets were fired at the Eshkol Regional Council and two at Hof Ashkelon. No injuries were reported. The IDF Spokesperson's Unit said that the Air Force attacked two rocket launching sites in the northern Gaza Strip overnight as well as arms production and storage sites in response to the rocket fire on Israel's south. Direct hits were carried out. Some 31 Qassams, mortar shells and Grad rockets were fired from northern Gaza at Israel throughout Saturday evening, as the defense establishment and the south's residents brace for yet another round of violene. The fire followed a border attack that saw terrorists launch an anti-tank missile at an IDF patrol near Karni crossing. Two soldiers were seriously wounded and two others were moderately injured. IDF tanks fired at terror targets in the Strip following the attack. Gaza medical sources said that four people were killed and 25 others were injured. The IAF struck a terror cell preparing to fire rockets at Israel's south, the IDF Spokesperson’s Unit said Saturday. The IDF said that the pilots reported hitting their mark. Palestinian sources in Gaza said one man was killed and another man was injured in the strike. Over 30 Qassams, mortar shells and Grad rockets were fired from northern Gaza at Israel throughout Saturday evening, as the defense establishment and the south's residents brace for yet another round of escalation vis-à-vis the Gaza-based terror groups. Gaza's terror groups issued a uniform statement threatening retaliation, vowing that "Israel will pay for its crimes" and saying that they will "coordinate their response to the Zionist's massacre in Gaza." The rocket fire on Israel began at about 8:30 pm, when the Color Red alert sounded across the Gaza vicinity communities. The Eshkol and Sha'ar Hanegev regional councils bore the brunt of the evening's fire, with 25 projectiles landing in Eshkol alone. No injuries were reported. Around 9 pm, an air raid siren sounded in Ashdod, Yavne, Gedera, Gan Yavne and Ashkelon, as rockets were fired at the area. The Iron Dome battery deployed in the area intercepted three rockets. One shell was intercepted over Ashdod, while another landed north of the city, causing no harm. The IDF ordered the area's residents to remain within close proximity to shelters pending further instructions. IDF Chief of Staff Lt.-Gen Benny Gantz called a security assessment of the sector on Saturday night. Prime Minister Benjamin Netanyahu was briefed of the situation. Defense Minister Ehud Barak commented on the incident, saying: "The IDF reacted with force to the event and an additional response will be determined in the following days. We will not abide any escalation in the situation on the southern fence." Home Front Defense Minister Avi Dichter commented on the escalation in the south, saying that Israel "must reestablish its military deterrence in Gaza." He added: "Israel must rip the mask off (Palestinian President Mahmoud) Abbas' face, as he continues to shrug off any responsibility for the terror coming from Gaza." Alon Shuster, head of Sha'ar Hanegev Regional Council told Ynet: "We have been on constant alert for 13 years now… civilians on both sides will continue paying the price, until our neighbored regime changes its attitude, which is not likely to happen soon. "After 13 years of military operations and the Gaza pullout, we now realize there is no easy solution and that the country must address this situation." As a precautionary measure, Gan Yanve has suspended the school day for Sunday. The City of Ashdod and the Gaza vicinity communities said that they will decide on the matter on Sunday morning. Four soldiers were wounded Saturday when an IDF force patrolling near Karni crossing was hit by terrorist fire. The military jeep sustained a direct, through-and-through hit by an anti-tank missile. Two soldiers sustained serious injuries to the lower extremities and were airlifted to the Soroka Medical Center in Beersheba. Two others were rushed to the Barzilai Medical Center in Ashkelon in moderate condition, suffering from shrapnel wounds. The fire came from a location east of the Gaza Strip neighborhoods of Zeitun and Sajaiya. IDF forces scrambled to the scene and a heavy fire exchange followed, with the IDF using tanks and machine-guns to neutralize the threat. Gaza sources said that IAF helicopters were flying over the Strip's southern and eastern areas, as well. The Abu Ali Mustafa Brigades – the Popular Front for the Liberation of Palestine's (PFLP) military wing – claimed responsibility for the attack; but the IDF said that it was more likely the work of Islamic Jihad militents. Later Saturday, the Al-Arabiya network reported that the Izz al-Din al-Qassam Brigades claimed the attack. Gaza medical sources reported of four fatalities and 25 casualties as a result of the IDF's shelling. The causalities were taken to Shifa Hospital in Gaza City. Ayman al-Sahbani, a doctor at Shifa, said all of the casualties were civilians and the children were among the wounded. Hamas security forces reportedly cleared all posts in the vicinity of the scene, fearing an imminent Israeli strike. The IDF confirmed the incident's details: "An anti-tank missile was fired at an IDF force on routine patrol near the security fence in northern Gaza Strip. Four soldiers were wounded as a result. IDF forces returned fire. "The IDF will not tolerate any attempt to harm Israeli civilians or IDF soldiers and will continue to fight any element which employs terror against the State of Israel. "The Hamas terror group is responsible for any such acts," the statement said. The GOC Southern Command has launched an inquiry into the incident. IDF Chief of Staff Lt.-Gen Benny Gantz called for a security assessment of the sector. The IDF ordered the residents of the Gaza vicinity communities to remain within close proximity to shelters. Defense Minister Ehud Barak commented on the incident, saying: "The IDF reacted with force to the event and an additional response will be determined in the following days. We will not abide any escalation in the southern sector." Following the attack, the Defense Ministry ordered the temporary closing of the Kerem Shalom crossing. The crossing is the main checkpoint through which goods are delivered to Gaza Strip. "The IDF will not risk the lives of the crossing's employees, or the troops stationed there, despite the great importance of ensuring goods and humanitarian aid are delivered to Gaza," a defense source said. The Hamas rulers of Gaza do not shed a tear when Israel takes out global jihad terrorists. 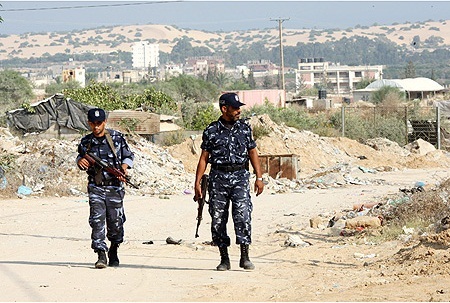 This was the case Sunday night when the Air Force targeted two terrorists in Rafah, only this time 11 passersby, including women and children, were also injured – two of them critically. Monday's rocket and mortar barrages, launched by Hamas and Islamic Jihad, were a response to the injuries incurred by Palestinian civilians. Islamic Jihad pushed for a response. Over the past few weeks the terror group's leaders have been pressing Hamas to end the unofficial ceasefire with Israel and reinstate the "respond to every targeted killing" policy. So far Hamas has been able to restrain Islamic Jihad, but on Monday, as a result of the civilian injuries, Jihad announced that it would act independently. Hamas had no choice but to join in. The rocket attacks were a joint Hamas-Islamic Jihad effort carried out, according to a statement co-signed by both terror groups, in response to "continuous and repeated enemy crimes against our defenseless people." The global jihadists who were killed were not even mentioned. Hamas and the global jihad-affiliated groups are fierce enemies, and the Islamist group's security forces in Gaza fight them relentlessly. Hamas deems these terror groups a threat to its rule in the coastal enclave. Moreover, Egypt is demanding that Hamas operate against these groups due to their links to fundamentalist terror groups based in the Sinai Peninsula. Despite the fact that it took part in Monday's assault, Hamas made certain its response would not lead to major escalation. The terrorists did not fire any Grads, but mostly rockets and mortars that were aimed at open areas and the outskirts of Israeli communities. Hamas has no interest in resuming the fighting with Israel, as it is preoccupied with building relations with the new government in Cairo and trying to prove to the Muslim Brotherhood that it is a stable and responsible ruler. This is why Hamas took part in Monday's attacks, but in a cautious and measured manner. The IDF also avoided a response that could have resulted in a serious escalation of violence. The aerial bombings in response to the rocket fire focused on open areas in Gaza, causing a lot of dust and noise, but no casualties. Both sides do not want to fan the flames at this juncture. This round of violence has likely ended, but it must be remembered that one rocket landing in the wrong place can quickly lead to a resumption of the fighting, in full force. Attack on the south continues: Three Qassam rockets exploded Tuesday, two near Sderot and one in the town of Netivot. In both cases, the rockets hit open areas and no injuries or damage were reported. Against the backdrop of political unease, in light of Prime Minister Benjamin Netanyahu's Tuesday announcement that the elections for the Knesset will be held earlier than expected, Sderot Mayor David Buskila commented: "Israel is heading toward election when there are still unresolved defense issues." "The continuous rocket fire towards Israel indicates that something has happened to our ability to deter," Buskila continued. "We shouldn’t let those who threaten us determine the agenda. At the moment, they're the ones who decide that we won't get any sleep at night, when we will wake up, or when we will run to the shelters – and we have no say in the matter. "I think that when it comes to this threat, it would be best if the current government would hold office for one more year, until the end of its term, so that it would be able to address those issues and find a solution." Earlier on Tuesday, a Qassam rocket exploded in an open area in the Shaar Hanegev Regional Council and another rocket exploded at the Eshkol Regional Council near the Gazan border.No injuries were reported in either explosion. Dozens of rockets and mortar shells that were fired towards Eshkol on Monday hit two structures in the council, causing damage. The military wings of Hamas and the Islamic Jihad's claimed responsibility for the attacks. Palestinians said that the attacks came in response for IDF strikes on Hamas posts in Gaza, in which five people were injured.